Blurb: “There is someone in the car…! !” Ankur said,his voice thick with terror.Vyas who would normally scare easily, seemed surprisingly calm.Perhaps due to his stint abroad, Vyas was somehow familiar with car hijackers. “Listen Anks….don’t panic,I’ll just check…” Vyas said.They were standing a few feer from the car and Vyas a bit hesitantly strode up v peeked into the black Honda City. And sure as day, there was an elderly lady seated inside.For a few seconds,even Vyas was a bit comfused, and even as he turned to confirm to Ankur the possibility of being kidnapped by a frail octogenarian, he noticed a rather strange thing. The elderly being seemed to have left the car. Even as the doors were securely shut.A chill ran down Vyas’s spine.Meanwhile a lot worse things , were happening to Ankur’s spine as the elderly ‘ghost’ made an appearance before him. Well,don’t you find blurb quite interesting and good enough to catch your attention? Yes, the blurb is fascinating, and is a part of first chapter, from where the life of two friends take a twist.Also,the title and cover design seems intriguing with the blurb.So,this book eventually passed the first stage of picking it up. 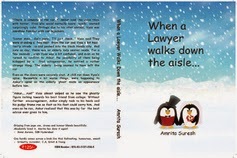 The readers who have expected a penguin on the cover of this book too, are up for a surprise because this time the author had two penguins on the cover and that also in marriage attire. The blue color, the snow everything gives the cover a soothing effect which perfectly reflects the soothing quality of the content. The blurb doesn’t give a proper outline of the plot and the missing author bio and acknowledgement is also a bit disappointing. The story starts with Ankur Palekar aka Anks, a talented lawyer who meets with a ghost of an aged lady, Mrs. Shireen Lakdawala. The lady asked then to believe that she was ferociously killed by the Mazumdar builders. After quite delay Anks decides to take the case and ropes in her friends and fiancé. Then the story starts to takes the speed. The author have introduced limited number of characters and mingled their stories wonderfully. All the characters have a particular role to play and a different story to tell. I loved the way the author has injected the humor in the story. It not only makes the whole journey of reading the book interesting but forces the readers to complete it one go. The short distribution of chapters goes in the author's favor and helps to hook the readers. The narrating style and the forming of the plot is the main usp of the book. The quite different and easy going plot can come like a breeze of fresh air to the readers. The narrating style has a soothing effect which the readers can enjoy while relaxing in a weekend. No one needs to think while reading it and can enjoy this book as a wonderful light read. There are quite a few errors to point out, which could have been ignored. The editing could have been better and the grammatical errors can be omitted. There are punctuation errors too which were annoying and can lose the grip on the plot. Apart from these errors this book is overall a nice and enjoyable read. I would recommend this book to all those who were searching for an interesting and refreshing light read.